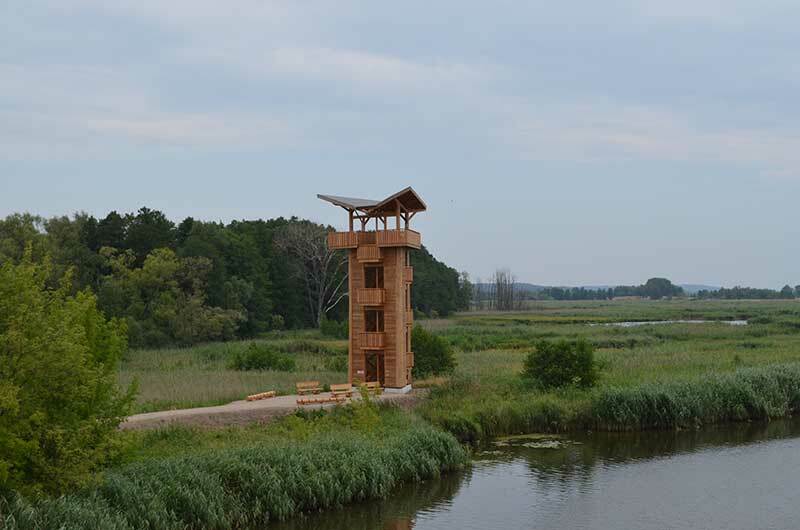 The newest observation tower in the Lower Oder Valley National Park is located directly on the Oder, just north of the Mescherin border bridge. With its slender design and curved roof, which was inspired by the wings of a crane, it forms an architectural attraction on the northern edge of the large protected area. 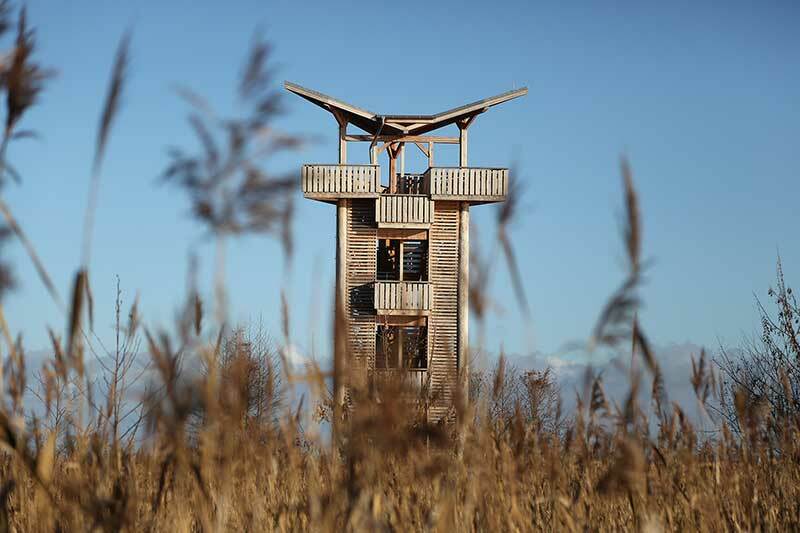 From the 11-metre-high observation platform, the visitors have a magnificent view over the Staffelder Polder. Here, visitors will have a look into the future of the Oder Valley. For the wilderness in the Staffelder Polder has been able to develop undisturbed for 20 years. Large areas of reed-rich landscapes, punctuated by watercourses, dominate the area. With the establishment of the conservation area in 1995, the commercial use of the northernmost border polder in the National Park had already come to a halt; the 63-hectare area was handed back to nature. 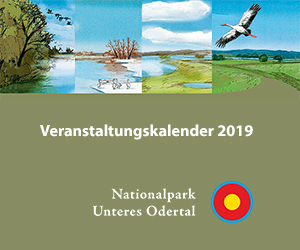 This makes it one of the oldest wilderness areas in the Lower Oder Valley National Park. In 1999, the Oder dyke bounding the Staffelder Polder was slit open in three places and a total length of 200 metres was completely removed. This means that the Oder water can spread freely in this area during floods. 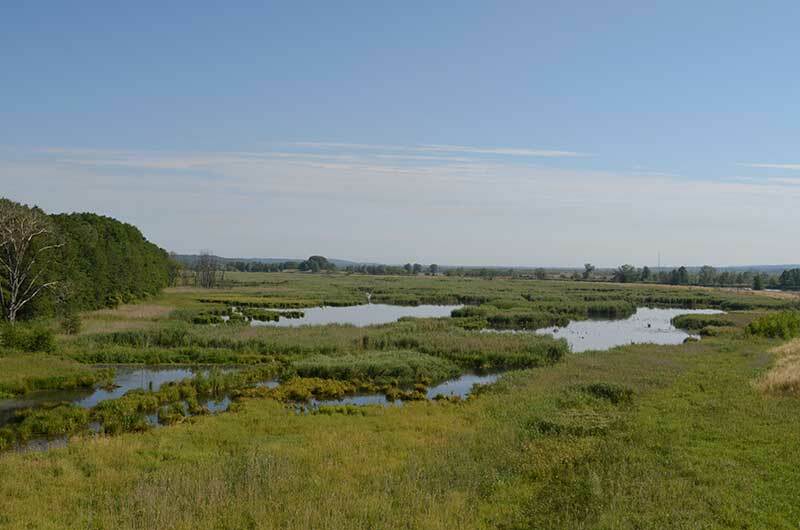 As a result, the natural conditions for the formation of floodplain moors have been restored. In the foreseeable future, the once drained land will recover its most important ecological functions, i.e. binding nutrients from the Oder and storing carbon dioxide. Furthermore, the living moor can store water. It absorbs water during periods of high water, which it then gradually releases in dry periods. Nature observers can find crane roosts here, among other things. The dyke slot cost 230,000 EUR, it could be realized as compensation and replacement measures within the scope of the enhancement of the Oder dyke. The total costs for the Mescheriner observation tower amounted to approx. 260,000 EUR. Larch wood from the Märkisch forests was used for its construction. The tower was built with the help of European funding as part of the German-Polish INTERREG project of the Lower Oder Valley National Park and the Stettin Regional Directorate for the Environment. 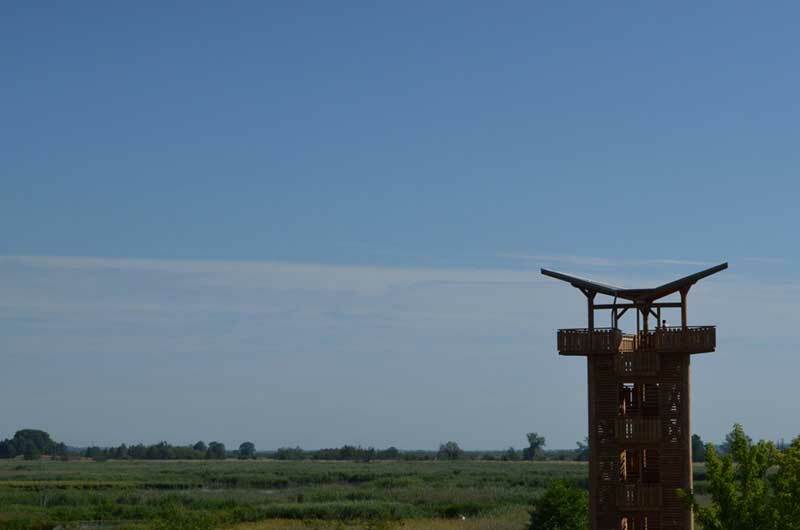 The observation tower is located at one of the connections between the Lower Oder Valley National Park and the Polish Landscape Conservation Park of the Lower Oder Valley (Park Krajobrazowy Dolina Dolnej Odry). It is easy to reach: driving by car, take the B2 and the B113 to Mescheriner Oderbrücke and park in the National Park car park at the Mescherin village entrance. 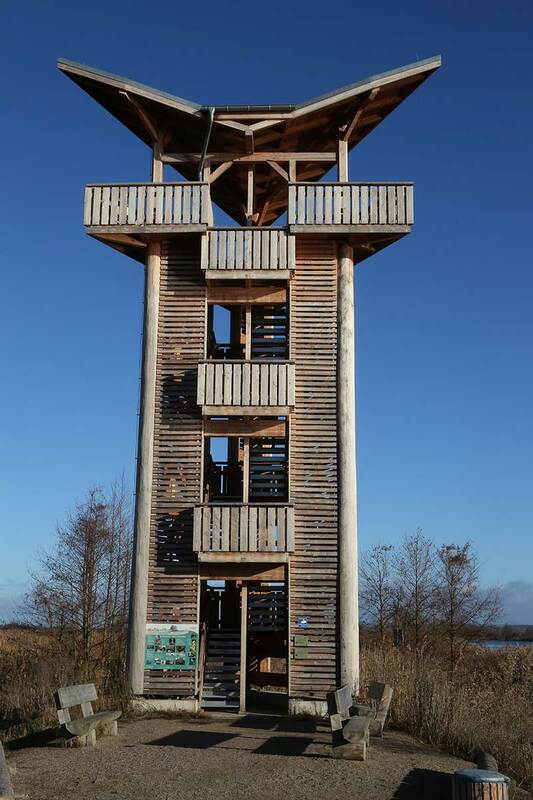 The observation tower is then reachable by foot, located 150 metres from the car park, just north of the bridge on the Oder bank. Crossing the Mescherin bridge, visitors can go to the eastern side of the Lower Oder Valley. There are several dining facilities to choose from in Mescherin. A small camping site invites you to stay the night during the summer months. It is often visited by cyclists who are on the Oder-Neisse cycling route.